History is full of wonders as long as we don’t notice some fundamental concepts, its been thousands of years and signs are playing an important role in our day to day life in various forms. To simplify the message, to minimise the size of information and to save a lot of time, we use symbols. We encounter thousands of signs and symbols. But have you ever wondered about those symbols’ origins? And are we using them in the correct manner? If we keep connecting such doubts then we can easily form a thread of unknown things that might stretch beyond the length of China wall. However, here at this moment, let us consider seven most popular and significant signs without which our day won’t pass. On this way of unleashing these mysteries, let us start with the popular keyboard sign ‘&’, ampersand. At first, it was created several hundred years before by Cicero’s secretary Tiro. By the early nineteenth century, kids started inserting the phrase “and per se and” to distinguish it, and over time, this all got blended together to sound more and more like “ampersand.” The mondegreen name for the centuries-old symbol first appeared in the dictionary in 1837. Over time, the letters ”E” and “T” have merged into the symbol we use today. This symbol probably looks like nothing understandable, but the real means right there in itself. 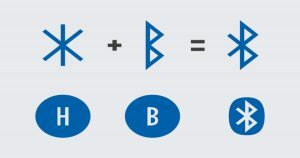 Bluetooth symbol when elaborated looks like the combination of B and H, now, for details we need to switch back to the tenth-century story when Denmark was ruled by King Harald Blåtand, a historical figure famous for uniting Danish tribes into a single kingdom. Harald was often called “Bluetooth“ since he was a known lover of blueberries, and at least one of his teeth had a permanent blue tint. These two runes from the initials of Harald Blåtand’s name. By the way, a first generation Bluetooth device was coloured blue and — yes, you’ve guessed it — resembled a tooth. This symbol is seen everywhere even on the device we use to read this article, or be it the mobile we carry anywhere. Despite its necessity, very few people know about its origin. As early as the 1940s, engineers used a binary system for representing specific switches, where 1 meant on and 0 meant off. In the following decades, it has transformed into a sign that features a circle (zero) and a vertical line (one). In the semaphore alphabet, the letter ”N“ is transmitted by holding two flags in an inverted ”V,” and the letter “D” is formed by holding one flag pointed straight up and the other pointed straight down. Superimposing these two signs forms the shape of the peace symbol. Yet another theory says that the ”OK” gesture by itself is nothing other than a mudra — a ritual gesture in Buddhism and Hinduism. The sign symbolises learning, and many Buddhist artworks depict the Buddha making this gesture.